The Work-house in St Andrew's Parish Hertford, was open'd June 20, 1724. It cost about £400. The Money was borrowed at £5.5s. per cent. to sink the Principal in 99 Years; or the Parish may redeem or pay off the Mortgage when they please. Before this House was erected, we paid about £14 per Annum Rents for the Poor; and the whole Expence for maintaining them amounted to £200 per Annum : But such great Numbers, rather than come into the House, quitted their Pensions; that now £100 will carry the Parish thro' a Year. The Poor are now more industrious; there are about ten in the House, who are imploy'd in spinning Wool, and in making and mending for one another; and they earn about 8s. a Week. The Master is allow'd 5s. a Week and his Lodging, with Provisions for himself and Family in the Work-house. The Parish Officers of All-Saints and St. Andrew in this Town, have severally obliged themselves and their Successors, by Articles, to pay the Master of the Workhouse erected in St. Andrew's Parish, June 1724, 1s. 10d. Weekly, for every poor Person that shall be sent into the said Workhouse, till June 1734, each Parish for their own Poor, under such Restrictions as are mentioned in the Articles of their Agreement, the Master to have all they earn, and to employ them in, or out of the House, as he pleases, but mostly in the House, on spinning of Jersey. The Parishes pay the Rent, find Repairs, Goods, Cloaths, and Physick, for all that are taken ill in the House. The Parish-Officers are to bind, or put out as they please, any Children that are fit. The Master is to keep them in a neat and decent manner, and to find them with good wholsome Food, and eight Trustees, viz. 4 of each Parish, are appointed to hear, and have Power to redress Grievances; the two Parishes and Master of the Workhouse, have bound themselves in the Penalty of 50 l. to perform Covenants. THEIR Weekly Bill of Fare is as follows. N. B.. None are Stinted as to Quantity, but all eat till they are satisfy'd. A parliamentary report of 1777 recorded parish workhouses in operation in Hertford—All Saints (for up to 30 inmates), Hertford—St Andrew (50), Hertford—St John (24), Little Amwell (4), Bengeo (15), Hertinfordbury (30), Tewin (20) and Walkern (20). A house on Horns Mill Road in Hertford, dating from around 1820, served as the poorhouse for the Liberty of Brickendon. The population falling within the Union at the 1831 census had been 12,155 — with parishes ranging in size from Bramfield (population 204) to Hertford St Andrew's (1,826). The average annual poor-rate expenditure for the period 1832-35 had been £8,202 or 13s.6d. per head of the population. Initially, the new Hertford Union adopted an existing parish workhouse and in 1836, the Poor Law Commissioners authorised an expenditure of £350 for its adaptation. 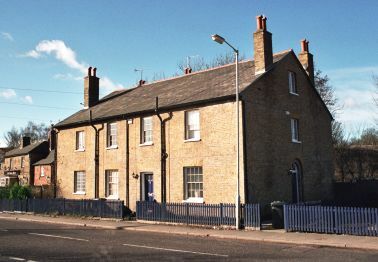 A new Union workhouse was erected in 1867-9 on Ware Road to the east of of Hertford. The site, on high ground, was known locally as Gallows Hill. 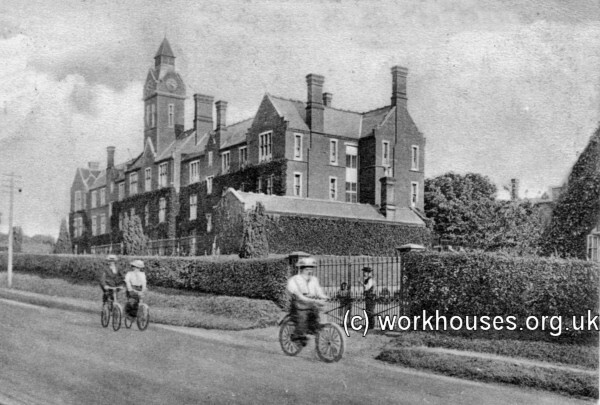 Hertford Union workhouse from the north-west, c.1905. The buildings, for 250 inmates, were designed by Frederick Peck who was also the architect of Union workhouses at East Grinstead and Chatham. It cost £12,000 and was constructed of red brick by local builder Henry Norris. The three-storey Jacobean-style building had mullioned windows, gables, and a central clock tower. 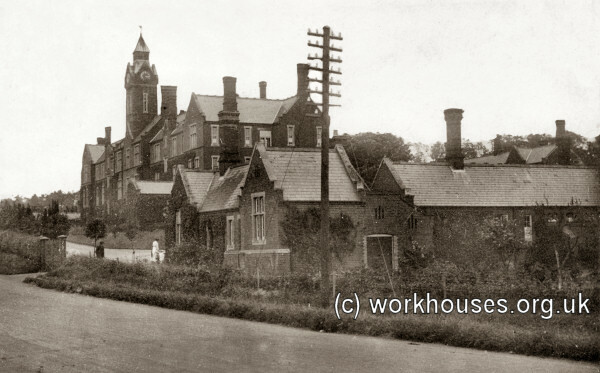 Hertford Union workhouse from the north-west, c.1910. In 1919, the Hertford workhouse was taken over by the Hertfordshire County Committee for Mental Defectives and the existing inmates were dispersed to the St Albans and Ware workhouses. The Hertford Poor Law Union was itself dissolved in 1924. The workhouse building later became Kingsmead Special School. The site has now been redeveloped for residential use. Hertfordshire Archives and Local Studies, County Hall, Pegs Lane, Hertford SG13 8DE. Holdings include Guardians' minute books (1835-9, 1858-62, 1887-1916); Births (1847-1919); Deaths (1847-1919); Admissions and discharges (1873-6, 1887-1916); etc. An Account of Several Work-houses for Employing and Maintaining the Poor. Anon, 1725.